One example of the advanced local ecosystems is the decision to be one of the first constructors of 5G test networks and construct two of them in Oulu. A significant number of international corporations relocated to Oulu during the second half of 2014. This surely must be a record in the Finnish industrial history that such a major contribution was made to the field of development in hi-tech in such a short period of time. Eleven of these corporations are in ICT and almost the same number in other fields. Over the past couple of years the ICT ecosystem in Oulu has diversified considerably: While it earlier depended on two drivers, the mobile phone and mobile network knowledge and knowhow, it is complemented by clusters producing finance, health tech and automotive solutions. The companies established in Oulu in fall 2014 employ more than 500 people at the moment and are determined to grow further during the coming year. The City of Oulu warmly welcomes all these actors to participate in the dynamic ecosystems in Oulu and wishes to express their special thanks to individuals and teams who unhesitatingly seized the opportunity to promote the world’s most skilful and knowledgeable workforce in their field, former Microsoft and Broadcom employees, along with the local research and development culture which is forward-oriented and capable of successful cooperation. Why did these companies come to Finland and to Oulu in particular? Oulu ecosystem has established itself as the hot bed of wireless technologies. Its available pool of skilled workforce trained by world class companies and educated by the University of Oulu and Oulu University of Applied Sciences, has attracted many companies to invest and build their business on Oulu’s wireless roots. Oulu offers an opportunity to be a part of the development of future technologies. Oulu - the Capital of Northern Scandinavia has the basis of 30 years of technology success stories. The Oulu ecosystem covers the creation of wireless products and systems, from the design phase right up to production. Processes are carried out in a uniquely rapid and productive fashion. Global ICT players are making strategic investments in Oulu. Today, Oulu is a stronger R&D community of several global companies. Indeed, Oulu is the best place in the world for developing hi-tech-based products from an idea to a complete product for the global market and for companies and consumer-clients to use. One example of the advanced local ecosystems is the decision to be one of the first constructors of 5G test network and construct it in Oulu. 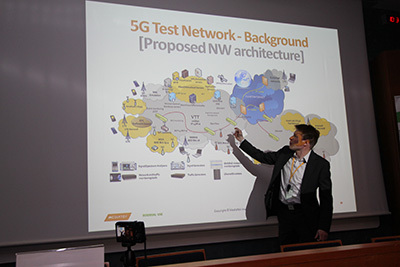 VTT will open the network for all enterprises and Oulu University shall set up a public 5G network for researchers, companies and students where future products and service innovations can be developed in an open test environment. Training and educational possibilities, housing, quality of life, culture, leisure time and life in general are well provided for in the Oulu region. The region has 250,000 inhabitants with an average age of 34.6, which makes it the youngest region in Finland. In terms of entrepreneurship, we offer the most interesting ecosystem in Europe. Oulu’s medical technologies ecosystem is a multifaceted network consisting of the university, public organizations like the city hospital and the VTT Technical Research Centre, and various health-tech manufacturers and biopharmaceutical companies. Active promotion of this health ecosystem is managed by the organization OuluHealth, which has formed a strong network between the city’s key players in life science and health-related fields. Oulu Innovation Alliance (OIA) is a unique collaboration, which integrates top know-how from printed intelligence, wellbeing technology, wireless technology, cleantech and 3D internet and connects research institutions, businesses and public sector organizations. OIA generates cutting-edge global business from research, development and innovation projects and ventures. High-tech ICT leverage from long-term assetization, HILLA-program, focuses on doubling Oulu's 2 billion hi-tech exports. Through the Tekes steered national program, skillful personnel is directed to the fast-growing and future growth industries. This way fast ITC regeneration can be achieved and opportunities in novel research and business sectors can be implemented. As Finland’s fastest growing city, Oulu is an international city full of opportunities. At the moment there are major business and development projects in the Oulu region and the confidence in Oulu’s growth is stronger than ever. Oulu – Capital of Northern Scandinavia – growth and development hotspot of Northern Europe. BusinessOulu is in charge of implementing the City of Oulu's industry policies, and providing growth companies with the services they require, in addition to promoting export, import, investments, and employment. With the help of its international partner network, BusinessOulu acts as a partner to companies and helps them grow, particularly in the North, where it leads and participates in the operations of Suomi-talo (”Finland Houses”). BusinessOulu persistently develops tourism business, conferences, congresses and events. Oulu’s innovation environment, ecosystems, and think tanks create innovations in a bold and productive manner. The aim is to rapidly develop business opportunities and significantly increase start-up investments. BusinessOulu’s OuluHealth ecosystem is in charge of the Health of the Future scheme, part of the national Innovative Cities (INKA) 2014–2020 program.